Hanny van Arkel was 24 years old and teaching primary school in Heerlen, the Netherlands. She also played guitar and during summer vacation back in 2007, she was noodling around on the website of a famous rock guitarist named Brian May. Brian May got famous in the middle of a doctorate in astronomy on interplanetary dust, so his website had links to astronomy websites, and Hanny clicked on a new site called Galaxy Zoo. A week or so before, Galaxy Zoo had posted a million galaxy pictures and asked the internet to please classify each one according to whether it was a spiral or an elliptical or something else-astronomers need these classifications, a million galaxies is a lot to classify, computers are no good at it and humans are spectacular. 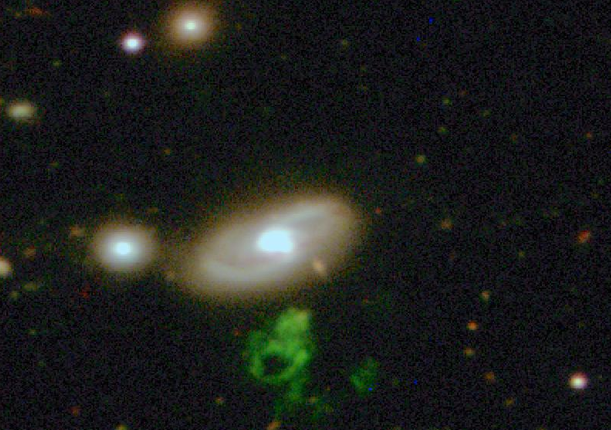 So Hanny took a little online lesson and started clicking-spiral, elliptical, spiral-and after each click, another galaxy popped up. She’d just classified IC 2497 as a spiral and was looking at the next one, then thought, “Wait, what was that?” and clicked the back button. By early January, 2008, the astronomers figured out that Hanny’s Voorwerp was at the same distance as IC 2497. Then they found out it was a cloud of gas in a state of excitement brought on only by being hit with hard ultraviolet and xrays. Unfortunately IC 2497 didn’t look capable of generating that kind of excitement. So they looked at the Voorwerp again, but with bigger optical telescopes and in xrays, radio waves and ultraviolet light. They compared, they argued, they discussed its every ramification and aspect, decided it was more green than blue. By May 30, Hanny’s 25th birthday, they’d asked for and received time on the Hubble Space Telescope. By July, it was all over the internet. By November they’d figured out that the Voorwerp was embedded in a cloud of gas so big it hid IC 2497’s center, and in the center was a black hole out of which shot a hard x-ray jet-and where the jet hit the gas, it made the Voorwerp. Hanny had gotten famous-interviewed, photographed, travels all over to give talks. Brian May congratulated her, some scifi/fantasy guys are turning her into a webcomic, to be released this fall. She likes all this. But she hasn’t gotten any makeovers, she still looks like she plays guitar and teaches school, though she’s moved on to teaching secondary school now, in the school she herself had attended. And she still clicks on galaxies at Galaxy Zoo. Somewhere in the process she took her first airplane flight, and coming in to land at night, she thought the city below looked like upside-down stars. She says she likes telling people how cool science is and that everybody can do it. Here, try it. Ann Finkbeiner is a science writer. For several years now, she’s been mostly writing books. She’s just finished her last book, has no idea for another one and hasn’t a clue what to do next. She’s co-owner of The Last Word on Nothing. Photo: the Sloan Digital Sky Survey.